Best practices to secure and separate the personal from the corporate on mobile devices. The Bring Your Own Device (BYOD) trend has brought added challenges to the enterprise. As more employees connect to the corporate network with their personal devices, complexities emerge around data and management. When it comes to BYOD it is increasingly clear that there is a need for separation of the personal from the professional. IT administrators need a strategy on how to control policy, management, and data removal in isolation on personal devices. Organizations are turning to mobile virtualization to solve this issue. 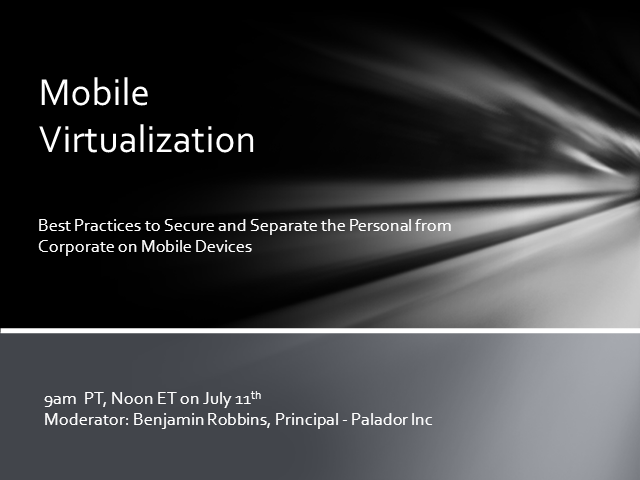 Join us on July 11th to discover the best practices on how to secure and separate the personal from corporate on mobile devices through mobile virtualization. • How are companies organizing to transform CX? • Who runs the projects, and who is on the teams? • What is a typical budget for digital CX? • What technologies are crucial for success? • How do companies measure success? • Which vendors receive the highest scores from their customers? As part of the planned Software spin-off and merger with Micro Focus, HPE’s Software organization is undergoing a major transformation to shape the combined company as uniquely positioned to help customers on challenges across a hybridized environment. And hybrid is much more than a buzzword. In today’s reality, not only do businesses have to deal with the rapidly changing technologies and multiple deployment models, but they also have to deal with the pressure of reducing their run costs and to constantly innovate. During this transformation, we have interviewed thousands of customers, conducting deep market research, allowing us to gain unprecedented market insights. Join this webcast and learn about the new waves of tech disruptors, and how, our combined, software pure-play company is going to shape the industry. The storage performance benchmarking dynamic duo, Mark Rogov and Ken Cantrell, are back. Having covered storage performance benchmarking fundamentals, system under test and most recently block components, this fourth installment of the Webcast series will focus on File Components. The adoption of Performance Engineering is not mainstream and being seen from Unicorns to Horses. Regardless of the company or your role, the need for education continues to grow as Performance Engineering is now how organizations are striving to operate. Join this webinar to learn from our panel of experts: what educational opportunities are available, how you can access them today, and when completed what you will know, so you can learn and share now. Success in the idea economy requires technological agility. You have to act quickly to seize opportunity, respond to threats, turn great ideas into reality and stay ahead of the competition – and these capabilities rely on having an amazing IT organization. Amazing IT teams are competent, aligned to the business, highly collaborative and constantly adapting to change. These attributes just don’t happen. You need talent, you need a continuous education strategy and you need the tools to make it happen. Join this webinar to learn how implementing a continuous education strategy using the new HPE ART Enterprise Learning Edition (ELE) will help your journey to amazing. Your workforce is using 3+ devices, is working from many locations, uses both business apps and a plethora of personal apps, and all while expecting to access their data easily and securely. How do you implement a solution that empowers your workforce while protecting your Corporate assets and resources? Discover Enterprise Mobility Suite (EMS) - a comprehensive cloud solution designed specifically to address the challenges of a mobile workforce. Mobile is omnipresent in our world today. This puts a constant demand on performance engineers to deliver apps that are faster and better – a challenge when you also have to deliver apps quickly with quality. Users have no patience for low performing apps. Join us for this and all future events in the Mobile performance testing webinars series. See a demo-rich overview of the new SharePoint mobile app to access and stay connected to the content that matters most to you across your intranet while you’re on the go; and how this translates to the new SharePoint home. Watch as principal engineer, Andy Haon walks you through the key elements that bring your Intranet into the cloud first, mobile first world, so that you can: navigate your sites and portals, and access important content, information and people. OneDrive for Business as part of Office 365, is designed to provide effortless, powerful file sharing and collaboration across all your devices with integrated security, privacy and compliance controls. Watch as OneDrive Director, Reuben Krippner, gives you a tour of the new and upcoming capabilities that make OneDrive the window to all your files in Office 365 regardless of whether they are in OneDrive, Office 365 Groups or SharePoint. Also, don’t miss a first look at new intelligent experiences for trending and suggested content as well as insights into the impact and reach of your work. Trust is a key principle of our ambition to reinvent business productivity. As we deliver SharePoint and OneDrive our commitment to security, privacy and compliance is unwavering. Learn from principal engineer Navjot Virk as she both explains and demonstrates Microsoft’s approach and upcoming capabilities for differentiated access, the prevention of unwanted data sharing and more, giving you better control over the security of your data. SharePoint Server 2016 represents a new generation of SharePoint, that brings our experience running SharePoint at scale in Office 365 to your datacenter. This allows us to bring innovation to you at a more rapid pace and on your terms; improve performance, reliability and scale, and provide a foundation for future innovation. Watch as SharePoint veteran, Bill Baer provides an overview of the key elements that make this possible including the new feature pack model; converged code base; the standard min-role topology and zero down-time patching. Whether you are a 1st or 3rd party SharePoint developer, the new SharePoint Framework offers a modern new client side approach that allows you to extend and customize SharePoint with high-trust code in ways that were previously unavailable in the Cloud. Watch, as program manager Daniel Kogan, provides an overview and demonstrates how the SharePoint Framework helps you to create beautiful, responsive solutions that you can customize to your own needs. Stay to the end to see how you can build and test SharePoint Web Parts locally with the new workbench, without having SharePoint running in your own environment. Enterprise wide area networks span tens, hundreds, thousands and even tens of thousands of branch offices resulting in a large hardware footprint, high power consumption, and significant cooling demands. It is no wonder that these networks can have a substantially negative impact on expenses, time and the environment. Join this webinar to learn how a cloud-delivered software-defined wide area network (SD-WAN) is green, lowers carbon footprints and is good for the environment and Earth. Gain a better understanding of how reducing cooling and power requirements in the branch, lower carbon emissions and fewer devices is helping businesses do more for the environment while at the same time saving money. Over the course of the past two decades, the debate over what makes for an engaging digital customer experience has been an ongoing conversation - over and over, anywhere and everyplace. As we dive deeper into the worlds of the Internet of Things, Enterprise Mobility and overall Digital Transformation, understanding how to best engage users is critical. If you subscribe to our philosophy, that user experience drives user adoption and user adoption drives ROI, then without a doubt, the best opportunity to earn ROI on such investments is to pay close attention to creating a compelling user experience. We'll discuss such topics specifically as they relate to these technologies. Come join Senior Analyst Mike Matchett's lively discussion about the concerns and challenges coming when the Internet of Things crashes into our enterprise datacenters. We think big data today is big, but future IoT data streams promise to swamp everything from servers to storage. And today's new big data applications will still need to become more real-time, more agile, distributed and even more scalable. What's coming down the road, and how should we start planning for the future today? This webcast will go for 30 minutes, followed by a 15 minute Q & A session, where the audience is welcome to ask questions. As has often been reported, human error is one of the largest factors in data center outages. Since estimates of the average cost of an outage now exceed $740,000, the ability to reduce or eliminate man-caused outages can make a substantial impact on the organization’s bottom line. In this presentation, Jose Ruiz, VP of Engineering Operations for Compass Datacenters, will present a case study on how the introduction of wearable technology has enhanced one customer’s operational performance substantially. With our ‘always-on’ society, business users are demanding untethered access to communication and information. Enterprise mobility and its integration with other forms of communications within the enterprise has forever changed how we interact in the business environment and is empowering organizations – large and small.